Shade screen on top of your pergola or trellis will block heat and create a cool updraft. 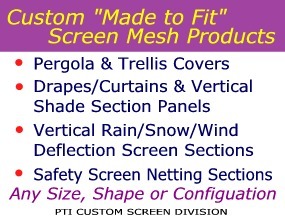 Your pergola or trellis cover can give you outdoor comfort and last for years. All that is needed is the proper shade screen material and for it to be correctly mounted. Two things must be considered: The openness of the weave and durability. The weave needs to be about 20% open to allow hot air to rise and escape. Screen with about 80% density works well. When hot air is allowed to rise and escape, the cooler ground or deck air created by the shade will rise to fill the void. This air-conditioning effect is what you want to achieve. For durability, you need a screen that contains UV inhibitors that protect the screen from becoming brittle by sunlight deterioration. The cover needs to be mounted in a manner that it is held tight and not allowed to billow. If it billows, it will become a sail and high winds can rip it away. This is why mounting on top of the structure rafters is much better than attempting to mount below. How much of the overhead structure that needs to be covered depends upon where the pattern of shade needs to be. Certainly, the people below wish to be in the shade. However, the area of the ground or deck which will provide the creation of cooler air is also an important factor. If direct sunlight from one or more sides of the structure is engulfing the area needing shade, then shade screen will need to be applied to those vertical locations also. This protection may be in the form of shade screen drapes, curtains or be a permanent installation. Construction of the cover should be similar to that of a tarp. Edges should be hemmed for strength and grommets should be inserted around the edges and spaced out at about twelve to sixteen inches apart. The use of grommets is valuable when fastening directly to a wood or an extruded aluminum structure. They are a necessity when rope lacing or tying off to a tubular frame. If lacing, the the grommet spacing should be closer to six inches apart. The staff at Protect Industries is always ready to assist whether it be choosing the right screen or innovative mounting design for hard to attach areas.